Cornbread is not an especially difficult item to make, but like most other baked goods it does take time and organization. For those who don't always have the time, boxed cornbread mix can be a convenient timesaver. Most brands produce a consistently reliable cornbread, but a few additions can make them taste sweeter, moister and more homemade. There are several ways to make cornbread sweeter. The simplest and most obvious is to add more sugar. While this is effective, other sweeteners can also help make the cornbread moister. Light brown sugar, corn syrup and honey are all hygroscopic sweeteners, a term that simply means they attract moisture from the surrounding atmosphere. Although the amounts involved are minimal, it does help keep the cornbread moister over a period of a day or two. 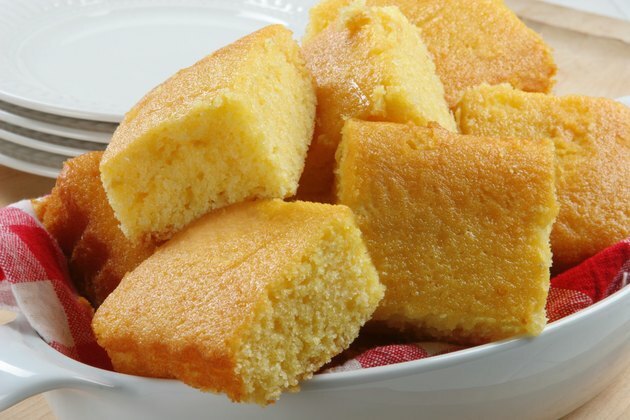 Most cornbreads contain relatively little fat, compared to cakes or cupcakes. They don't need much to be palatable, but even a small increase in the amount of fat can make cornbread richer and moister. Most box mixes call for one egg as a binding ingredient. Add the yolk of a second egg to make the mixture richer. The extra egg yolk will also help the batter incorporate up to 1/3 cup of additional melted butter, vegetable oil or other fat. Many cornbread recipes call for additional moistening ingredients to improve the texture of the finished product, and most of these can be applied to box mixes as well. A can of creamed corn is a common choice, adding moisture and a richer corn flavor to the cornbread. Other choices include sour cream, heavy cream, plain yogurt and shredded zucchini or other vegetables. Corn meal has a tendency to absorb available moisture from the batter, the grainy meal swelling and softening as it does so. One way to make the cornbread moister is by leaving the batter to sit for at least 20 to 30 minutes before baking it, giving the cornmeal time to absorb moisture from the batter. Add a few tablespoons of milk to restore the batter to its original consistency, then bake it as usual.